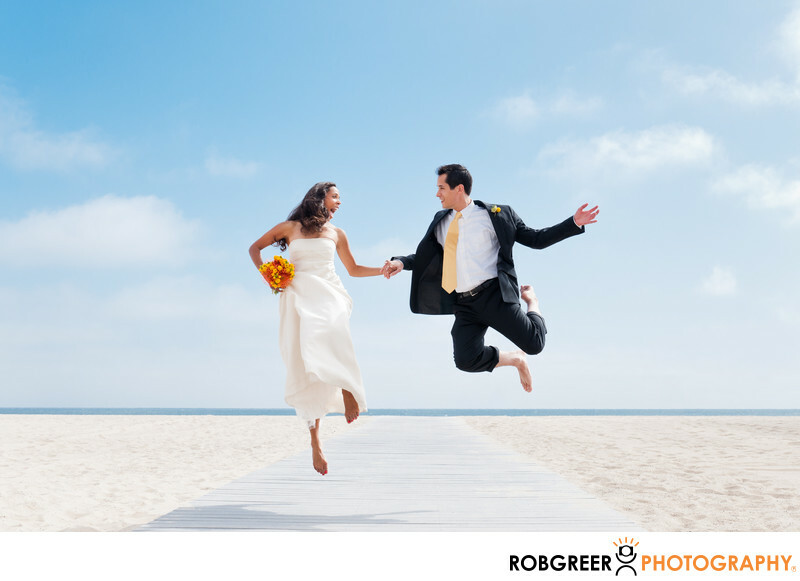 This photograph of a bridegroom jumping on the beach in front of the Annenberg Community Beach House in Santa Monica illustrates the joy between them. In fact, this photo truly represents the idea of "jumping for joy." For those of you who are familiar with Los Angeles, you'll know that I was fairly lucky to have the white puffy clouds in the background. It seems that more often than not, we are only presented with cloudless blue skies — not that I'm complaining. As you look at this photograph you may be wondering how I was able to get the groom to jump so high, but really it's not that difficult to make happen, even for folks who are not very athletic. If you look at some of the other jumping shots on my website you'll notice that everyone has great height. And when you have multiple people in the photograph, you'll notice that they jump together. I have mastered those kinds of photographs so that when we do them, we can do so quickly, and with amazing results. That being said, some couples may not want to have a jumping photograph during their wedding, and I'm totally fine with that. It's just something fun that I like to do at some events. Annenberg Community Beach House is located in Santa Monica, California. Phone: (310) 458-4934. Website: https://www.annenbergbeachhouse.com/. Location: 415 Pacific Coast Hwy, Santa Monica, CA 90402. 1/800; f/6.3; ISO 400; 48.0 mm.